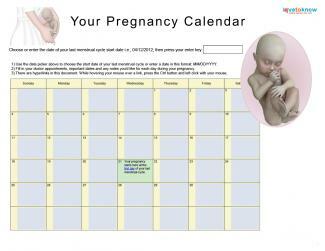 During the 25th week of your pregnancy, your little one is still growing fast and developing all the time. The highlight of this week is his newfound ability to hear your voice. By 25 weeks, you little one has grown to over 13.5 inches in length and weighs almost a pound and a half. According the Mayo Clinic, he can also now hear your voice and respond to loud noises from outside the womb. You may notice that your baby jumps when there's a sudden sharp noise like clapping hands. Your baby hears your voice all the time, but you can get Dad involved by having him read or sing to your belly. That way, when your little one enters the world, he will be familiar with both of your voices. The American Pregnancy Association reports that at this point in your pregnancy, the top your uterus reaches to about three inches above your navel. You should be able to feel the top of your uterus from about halfway between your belly and the bottom of your sternum. Around this point, your significant other may complain about your snoring. This is quite common and results from an increase in mucous production. In most cases, it will go away after delivery. Today, many women rely on hair dyes, relaxants, and permanents to maintain their physical appearances. According to the American Pregnancy Association, these dyes are probably safe for pregnant women, but it's best to avoid exposure as much as possible. Consider forgoing the dye for a few more months, or ask your colorists to keep the dye away from your scalp. If you enjoy getting regular manicures and/or pedicures, you won't need to avoid these beauty treatments during your pregnancy. However, you may want to use nail polish that is formaldehyde-free. You will also need to avoid getting acrylic nails, since the toxic fumes can present an unnecessary risk to your baby. If you regularly use anti-aging cosmetics, you may want to discontinue this part of your beauty routine. Some anti-aging products have been linked to birth defects. If you have questions about the safety of a particular product, ask your healthcare provider for guidance. A day at the spa can be a great way to relax, but you will need to avoid body wrap treatments while you are expecting. It's important to avoid overheating, and many body wrap treatments use essential aromatherapy oils that are not recommended for pregnant women. Always check with your healthcare provider about any beauty treatments you are considering. In the weeks to come, your little one will make a number of major jumps in development. Try to relax as much as possible, continue your prenatal care and good nutrition, and talk to your doctor about any concerns you have. You'll be meeting your baby in just a few months.